The Orpheus Silex is well styled, simply and solidly engineered, rugged, reliable, reasonably priced and guaranteed completely silent irrespective of the type of pickup, amplifier or speaker system, whether monaural or stereo. Motor and pickup isolated from their surroundings so as to completely eliminate rumble, hum and all noise, modulation effects and restricting mechanical feedback. This is guaranteed. Unique engineering design which reduces the total wow and flutter to less than a guaranteed 0.09%, ie completely inaudible. Speed settings constant throughout operation. Pickup mounting adjustable vertically and horizontally, and accommodating any pickup. 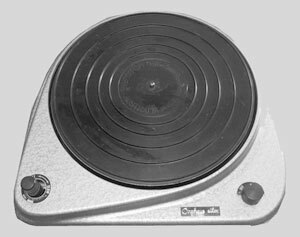 Moulded rubber turntable mat for maximum traction, with concentric rings so placed as to engage all size records from 7 to 12" by their outer edge. Orpheus Silex / Silex owners manual, service manuals and schematics are for reference only and the Vinyl Engine bears no responsibility for errors or other inaccuracies. The PDF files are provided under strict licence. Reproduction without prior permission or for financial gain is strictly prohibited. This website is not affiliated with or sponsored by Orpheus. Posted Fri, 09/25/2009 - 02:52 by johnnno97. thanks to all who have posted manuals on the Silex, especially the service manual which gives the belt size, John.